NEW YORK—There are an estimated 500,000 stray and feral cats in New York, and without intervention, the population will continue to grow. To combat the problem, which has largely gone unaddressed by the city, four New Yorkers from diverse backgrounds are working independently for a common cause. Simply put, they’re trying to find friendly stray cats new homes, help sick cats, and neuter and return the feral cats. Their work was recently profiled in the documentary “The Cat Rescuers,” which shows just how difficult, yet personally rewarding their task is. The Epoch Times spoke to the four volunteers to find out more about what they do and why they do it. Latonya “Sassee” Walker is a 49-year-old resident of Canarsie, Brooklyn. She works as an ACI biller during the day. Eight years ago she began moonlighting as a cat rescuer. “The reason why is because I started seeing kittens after kittens and hearing the fights outside of my window, and started paying attention to my surroundings, and it became very depressing,” Walker said. After complaining about it to everyone she knew, someone told her about a class to learn how to trap feral cats, so she took the class and took action. She and the other volunteers practice what is called “trap, neuter, return,” or TNR for short. Walker sets up a simple trap, and once she catches a feral cat she brings it to an animal clinic to have it neutered. After the procedure the cat’s left ear is clipped to indicate it has been neutered, and the feline is released back to where it was found. Sometimes it can take her hours or even days to trap a cat. When she sees a stray, whether it’s friendly or feral, she has a visceral reaction. “[I’m] mad at first. I’m always upset,” she said. She hopes to reach more people in her neighborhood to raise awareness about resources available to them to prevent cats from ending up on the streets in the first place. Walker recognizes she’s involved in a large undertaking, but she finds her work rewarding. “I can’t save every cat, but the one cat that I save is everything to him,” Walker said. Tara Green is a registered nurse, but once her shift ends another one begins. 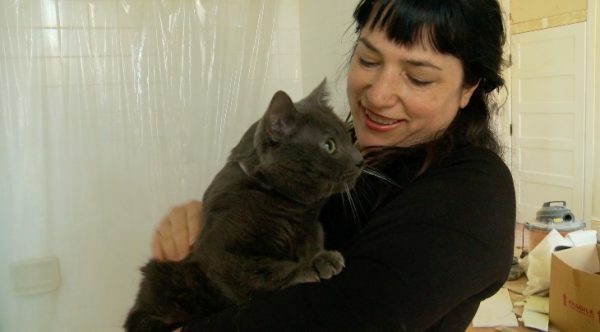 Green has always loved cats, and once she saw a colony of pregnant cats in Brooklyn she knew she had to get involved. One in six cats Green comes across is a friendly cat that has been abandoned. She fosters the friendlies and puts them up for adoption. She also has a network of people who help her with fostering the cats, and she has found homes for almost 300 felines this year she estimates. Green takes great care with the adoptions, and will check the home beforehand to make sure the cat will live in a friendly, safe home. The cats that are older or unable to be adopted she takes into her own home. For the feral cats she encounters, she employs the TNR system. The most rewarding part of Green’s work is when she finds a friendly cat that she can save, and seeing cats recovering and responding with gratitude to being rescued. Many of the friendlies she finds are very sick, and otherwise not taken care of. “It actually just happened last week. I went and rescued a very sick cat. He was dying, and I knew he was someone’s cat. He was friendly. He was letting me pet him. He was emaciated. He was so skinny, had a horrible cold, and he passed away with me at my house. I was angry. I was angry that someone could do this to this cat,” Green said. Claire Corey is a resident of Bedford-Stuyvesant, Brooklyn. She’s an award-winning painter and designer, and works at the Museum of Modern Art. She became a cat rescuer when she moved to the neighborhood 13 years ago and saw a plethora of friendly stray cats. There was one who approached Corey’s backyard, and she started feeding him. It was clear that the other cats in the area had been beating him up. “Eventually he came back in really bad shape, and he was in such bad shape that he had to be euthanized. And he was just the sweetest cat, and I thought after that I wasn’t going to let that happen again,” Corey said. Corey learned about TNR, and began searching for friendlies and ferals to rescue and stop as much suffering as she could. Corey both fosters and adopts the cats she rescues. The most rewarding part of her work is saving lives. Stuart Siet works for the New York City Fire Department as an electrical engineer, but when he’s not on duty he’s out on patrol looking for friendly and feral cats. He was walking his dog early one morning, and saw a man feeding cats and kittens. The next time he went out, the man wasn’t there, but the cats were. That’s when he took over. Siet goes out around 4 a.m. and puts food out for the cats in several locations for two hours. When he finds a friendly, he works with a variety of adoption and rescue organizations to put them up for adoption. He also currently has two friendlies in his own garage that he is trying to find a foster home for. He loves to see the cats being appreciative of the help. And he always has a can of cat food in his pocket. The largest obstacles for these cat rescuers seem to be people who aren’t receptive to their mission, and the lack of interest and funds from the city. Accessibility to low-cost spay and neuter facilities is also a big need. Nevertheless, these four New Yorkers are undeterred. All expressed a wish to educate people about responsible cat ownership to try to reduce the number of strays and prevent animal suffering. And all encouraged others to help out, whether that’s with giving money to provide services and resources, fostering or adopting a cat, or volunteering their time to help with rescues. “The Cat Rescuers” by Steven Lawrence and Rob Fruchtman premiered in New York on Nov. 10 and received the 2018 Zelda Penzel “Giving Voice to the Voiceless” Award at the Hamptons International Film Festival in October. For more information about the documentary and future screenings visit “The Cat Rescuers” website.